Mathieu Baudry's luck continues to go from bad to worse after he suffered yet another injury setback last week. The 31-year-old, who celebrated his birthday on Sunday, suffered a facial injury, which required stitches, but eventually limped off against Newport with a hamstring problem. The Frenchman had made just three appearances prior to his start on Saturday, but his latest setback means another spell on the sidelines. "I feel desperately sorry for him having played so well," said manager Paul Tisdale. "He ended up with stitches in his eyebrow but came off with an injury in his hamstring. He has been mighty unlucky because he has been playing so well. It will be a challenge for him to be fit for Saturday. But there we are, we have to move on." Already without Jordan Moore-Taylor, George Williams and Baily Cargill, losing Baudry is another blow for Tisdale. 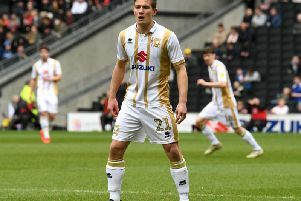 But the performance of Jordan Houghton, who stepped in to replace Baudry against Newport, has given the manager food for thought while Russell Martin too appears to have recovered in time for Saturday's visit of Crawley. Tisdale said: "Jordan Houghton played extremely well. It just reminded us, especially at home, he can play that position. And Russell Martin looks like he will be fit again for Saturday so it suggests we have the opportunity to go back to the three at the back, which opens up some options for me."